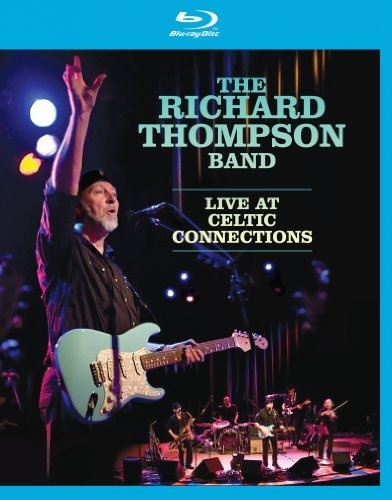 The sheer premium musicality of Richard Thompson and his dynamic band featured on this release is stunning. I would not be surprised if this blu-ray does for Thompson what Jeff Beck’s Live At Ronnie Scott’s did for Jeff Beck in terms of a commercial breakthrough for his career. In fact, even if you don’t own one Richard Thompson album, this show will make you an instant convert. For his considerable fanbase worldwide it only proves we told you how good he was, now you can see it and feel it. And what about Thompson’s band? Well. let’s put it this way. Drummer Michael Jerome is an engine fine tuned into Taras Prodaniuk’ s compelling bass lines which are welded to Thompson’s guitar work. You have to hear them and pay atteniton to just what the trio is doing. On either side of the stage Pete Zorn on guitars, flute. saxes and Joel Zifkin’s mezmerizing violin work push the band and Thompson into new heights. Rarely do you see a band groove together so well, while still letting the music breathe. The band and Thompson kick into high gear on Can’t Win and Tear Stained Letter, pull out jazzy inflections on Al Bowlly’s Gone To Heaven and breathe new integrity into his classic Wall of Death. Great closeups on Thompson’s intricate guitar work and bandmember’s solo’s. Intimate moments are well produced with a very full 5.1 Audio mix. On my copy there were a few blue shadows from the lighting rig that I did not like. They seemed to fall in on the top of bandmembers heads.